Today's Draw: Queen of Cups from the Tarot of the Tattoo Age in the Heart of the Matter position from the Deck of 1000 Spreads. Have you ever loved something before it even entered your life? Do you think it's possible to receive more love when you expect it, than when you don't? When is the right time to start loving someone? The Tarot of the Tattoo Age is a deck where each card is done by a different tattoo artist. The artists were given complete freedom to do what they wanted. As a result, a few of the cards make no sense to me...haha. It's as if a couple of the artists said "screw what this card is supposed to mean, I want to draw a rabbit!" 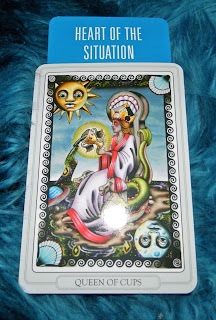 But for the most part, the cards show nice and, in some cases, inspired interpretation of tarot. The Queen of Cups is a spiritual, loving, compassionate woman. This particular card is one of the inspired ones in the deck. I'm not sure if you can see it in this picture, but what she is pouring out of her cup is the cosmos itself, complete with planets and stars and the moon. It is from her "cup of love" that the cosmos is created. About 30 years ago, I had a dream that still sticks with me. In this dream, I learned the meaning of life. And it was a four letter word—love. So here the Queen sits, right on the line between night and day, creating the universe with her love, emotions and compassion. It's a wonderful thought, huh? That we create in a big way through just love alone. If you're not familiar with the Heart of the Matter position, it's what's at the crux of the situation...at the root of it all. So this is the perfect position for this card. But the funny thing is, it's also a pun. Love is what's at the heart of matter...of all that exists. Anyway, I was talking to a friend today about creating through love, so this combo is perfect. We were discussing the idea of developing feelings for someone before you even meet them. In other words, if you're a single person, open your heart to your future lover now. Write them poems. Think about them—not in a specific way, like imagining what they look like, but think about what they feel like in your heart...and what your heart feels like with them. In a way, it's like the connection a mother has with her fetus. Well, not exactly the same, but kind of. You love this little person before it's even a person. It's part of the generative process. And that love is felt by the other, even though they may not know you're thinking about them. When you think of it, we usually love based on past performance. So we're like Missourians—show me why and I'll give you love. But what about the notion of loving on faith, like the way you love God? That's what we're talking about. Loving on faith and trust that love will be returned. Loving with the absence of proof...just "knowing" that love is on the way. Of course, this process isn't limited to love. You can appreciate a job before you get one. Show gratitude for a life-changing opportunity before it presents. And feel the grace of forgiveness before it's even given. Adding this technique to your manifestation or wishing process can be powerful. I always teach that it's better to wish for a feeling than a thing, because it's really the feeling you want—the feeling of having more than enough money, the feeling of love, etc. If you wish for the thing, you may receive it without the feeling. But if you receive the feeling, how can you lose? So what will you love into being this week?